On a night where Fire And Fury author Michael Wolff, continuing his ID badge-burning White House tell-all tour on The Daily Show, called Donald Trump straight-up “stupid,” the late-night comedy-scape was awash in similar sentiments. Following the weekend-long government shutdown—just in time to commemorate Trump’s one-year anniversary in office and wreck his $100,000/couple “look at me!” gala at Mar-a-Lago—no one was more scathing in his assessment of Trump’s performance than Seth Meyers. In his “A Closer Look” segment, the Late Night host spent a solid ten minutes comically excoriating Trump for a weekend’s-worth of being Trump. Only, you know, moreso. In response to Trump’s trolling tweet attempting to spin the massive second Women’s March against everything he stands for as a “look at me, I’m awesome!” rally, Meyers compared Trump’s actual or feigned cluelessness to a husband coming home to all his clothes dumped in the street and thinking, “I get it, you wanna see me naked.” (Trump should really file that one away for later.) 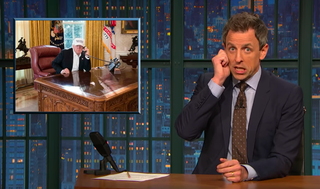 Meyers then pointed out the thoroughly documented phenomenon that, “there’s literally not one situation where there isn’t an old Trump quote that doesn’t completely contradict his current position” by showing clips of Trump condemning then-President Obama for the government shutdown that happened on his watch. Showing then-Trump (the reality show laughingstock claiming that the responsibility for a shutdown rests wholly on the president, Meyers noted how he, shockingly, agrees with everything that that Trump said—about current (presidential laughingstock) Trump. Old school Trump claimed, “It’s pretty sad because the whole world is looking at us and laughing at us,” which, in retrospect, is doubly sad, since, unlike President Obama, “ultimate deal-maker” Donald Trump saw the government grind to a halt when his Republican Party controls the White House, Senate, and House, something that’s never happened in modern U.S. history. Doubling down on the whole deal-maker myth that Trump trumpeted as one of his chief assets as presidential candidate (along with the best words, huge hands, bigly intelligence, and pretty much every other possible human attribute), Meyers went after Trump’s disengagement with the weekend shutdown negotiations and, seemingly, everything else. Quoting Trump’s own Chief of Staff John Kelly’s assertion that Trump’s demands for what Meyers termed Trump’s “absurd” border wall of racist awesomeness were ‘uninformed,” Meyers came down hard. Calling Trump a president, “who makes cartoonish demands that everyone knows are impractical, who has absolutely no guiding principles or knowledge of policy, and who changes his views on a whim,” Meyers sought to debunk the idea that Donald Trump is somehow ignorant of what’s expected of the leader of the free world, suggesting that the giant ego-baby with the nuclear launch codes simply doesn’t care enough to learn. Citing a New York Times quote from a Trump campaign staffer about the issue, Meyers admirably ripped off a tongue-twister to the effect, a nifty linguistic trick whose intricacies Meyers no doubt spent more time learning than Donald Trump spent on formulating a coherent immigration policy with the fates of hundreds of thousands of DREAMers in the balance. Saturday Night Live plays America&apos;s least favorite Trump-centric game show, What Even Matters Anymore?